What are the previous hack posts about? First post general rules, the Corruption ability score, new skills, a hit selection system, races, character backgrounds, the psyker feat. Eighth post Sneaky space marines (I am Alpharius) and Rogue Trader bards! Today’s Post covers the agents of chaos, specifically my favorite cult (the Cognitae from Dan Abnett’s Ravenor series–I’m definitely aiming at Zygmunt Molotch here) and a general psyker statblock. Apparently this post went a touch viral so I’m going to point out I have an awesome eastern fantasy noir campaign setting for D&D 5E with free PDFs, including a 40 page preview for the core book and beefy previews for all the print adventures: Mists of Akuma. 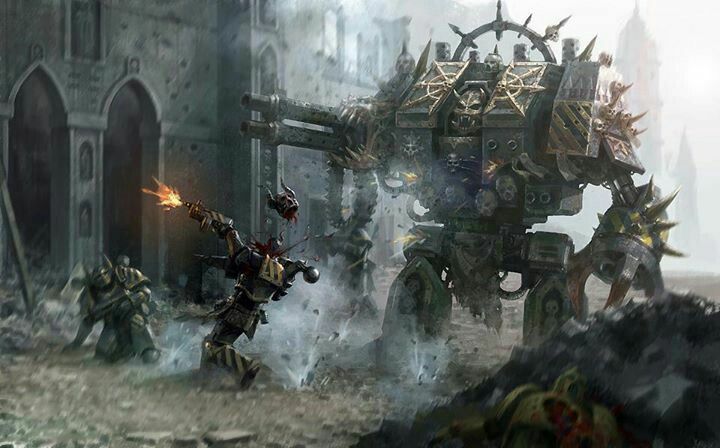 If you dig Afro Samurai and Onimusha as well as Warhammer 40k, you are going to love it. Saving Throws Cognitae Agents gain their proficiency bonus (+5) to all saving throws. Skills Cognitae Agents are proficiency (+5) with all skills. In addition, they have advantage on Deception, Insight, Intimidation, Investigation, Perception, Persuasion, Religion, Sleight of Hand, Stealth, and Technology checks. Cunning Action. On each of their turns, the Cognitae Agent can use a bonus action to take the Dash, Disengage, or Hide action. The Cognitae Agent may also use their bonus action to Dodge, but must wait 1 round before doing so again. Enuncia. After uttering an enuncia, any more uses of that word before the Cognitae Agent takes a long rest double the self-inflicted damage caused by it. Explivas – Explosion (Bonus Action, 4 self-inflicted damage). The Cognitae Agent spits out a word of primal malice that manifests into a wave of force. The Cognitae Agent makes a ranged attack roll against a creature within 30 feet. On a hit they deal 1d12+2 thunder damage. On a critical hit, the creature is knocked prone. Sana – Healing (Action, 5 self-inflicted damage). The Cognitae Agent whispers words of conjuring that destroy and rework their own flesh. At the start of the Cognitae Agent’s next turn, they regain 5d8+5 hit points. Unlike other enuncia, the repeated use of this word has cumulative penalties (10 damage for second use, 20 damage for third use, 40 damage for fourth use). Anteactus – Hindsight (Action, 12 self-inflicted damage). The Cognitae Agent utters a jibbering of syllables that pluck along the chords of fate, bringing the energies of moments in the past to their senses. As long as they remain motionless, the events of the past reveal themselves. Remaining motionless requires a concentration check every 30 seconds (DC 5 + 1 per previous check). If a creature is in combat within 30 feet, the Cognitae Agent has disadvantage on the concentration check. After 1 minute the Cognitae Agent can sense the strongest emotion associated with an area or object they are touching. After 2 minutes the Cognitae Agent can glean the general features of the creature the emotion belongs to. After 3 minutes the Cognitae Agent has a clear mental image of the creature the emotion belongs to. After 4 minutes the Cognitae Agent learns the person’s basic details (in what city they live, what their job is, and so on). After 5 minutes the Cognitae Agent learns the person’s name. Praesens – Foresight (Bonus Action, 10 self-inflicted damage). The Cognitae Agent whispers a questioning word from the void and in return they are gifted with glimpses of possible futures. The Cognitae Agent has advantage on their next d20 roll. Excaeco – Paralysis (Action & Bonus Action, 20 self-inflicted damage). The Cognitae Agent pulverizes their mouth to shout a potent word of command. The Cognitae Agent chooses a creature within 60 feet and makes a Strength saving throw opposed by the target’s Charisma saving throw. On a success, the Cognitae Agent paralyzes the creature until the beginning of the Cognitae Agent’s next turn. Nilum – Senseless (Action, 8 self-inflicted damage). The Cognitae Agent utters a baffling word that muddles the senses. The Cognitae Agent chooses a creature within 30 feet and makes a Wisdom saving throw opposed by the target’s Wisdom saving throw. On a success, the Cognitae Agent makes the creature blind and deaf until the end of the Cognitae Agent’s next turn. By spending a bonus action on their next turn and dealing 4 points of damage to themselves to continue uttering, the Cognitae Agent may extend the duration of the creature’s blindness and deafness by 1 round. Evasion. If the Cognitae Agent is subjected to an effect that allows it to make a Dexterity saving throw to take only half damage, the Cognitae Agent instead takes no damage if it succeeds on the saving throw, and only half damage if it fails. Minor Enuncia. The Cognitae Agent knows the light, mage hand, message, prestidigitation and vicious mockery cantrips (spell save DC 18). Sneak Attack (1/Turn). The Cognitae Agent deals an extra 42 (12d6) damage when they hit a target with a weapon attack and have advantage on the attack roll, or when the target is within 5 feet of an ally of the Cognitae Agent that isn’t incapacitated and the Cognitae Agent doesn’t have disadvantage on the attack roll. Void Shield. When activated with a bonus action, this device emits a forcefield around the Cognitae Agent. Whenever the Cognitae Agent would take damage, the forcefield is damaged first. The forcefield has 30 hit points and regenerates 1 hit point each round. When a forcefield is reduced to 0 hit points, the void shield breaks and requires a DC 20 Intelligence (Technology) check and 1 minute of work to repair. Deactivating a void shield is a reaction. Multiattack. The Cognitae Agent attacks three times. Unarmed. Melee Weapon Attack: +9 to hit, reach 5 ft., one target. Hit: 13 (2d8+4) bludgeoning damage. Archeodagger. Melee Weapon Attack: +9 to hit, reach 5 ft., one target. Hit: 17 (3d8+4) piercing damage. When using this attack the Cognitae Agent ignores any bonus to AC that the target gains from armor. Archeopistol. Ranged Weapon Attack: +9 to hit, range 200/800, one target. Hit: 17 (3d8+4) force damage. When using this attack the Cognitae Agent ignores and bonus to AC that the target gains from armor. Uncanny Dodge. When an attacker that the Cognitae Agent can see hits them with an attack, the Cognitae Agent can use their reaction to halve the attack’s damage against them. Magic Resistance. The dreadnought has advantage on saving throws against spells and other magical effects. Siege Monster. The dreadnought deals double damage to objects and structures. Source of Inspiration. By spending a bonus action, the dreadnought chooses a creature within 50 feet able to see and hear them. The target gains a move action, bonus action, or reaction to take before the start of the dreadnought’s next turn. Multiattack. The dreadnought attacks twice with their battleclaw or three times with their assault cannon. Battleclaw. Melee Weapon Attack: +11 to hit, reach 15 ft., one target. 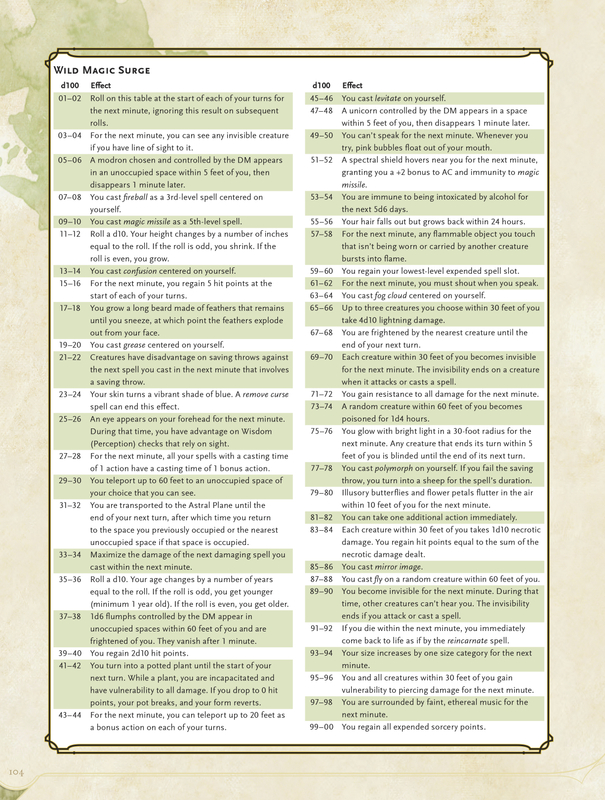 Hit: 45 (6d12+6) magical bludgeoning damage. Assault Cannon. Ranged Weapon Attack: +7 to hit, range 400/800, one target. Hit: 15 (2d12+2) magical bludgeoning damage plus 7 (2d6) fire and 7 (2d6) thunder. There are a lot of different ways to go about this and for certain psykers (my pyro-boi Vaun what whaaat!) you’ll want to lean into the elements a little harder (on the spell list swap in flame bolt, burning hands, scorching ray, fireball, fire shield, delayed blast fireball), but for your generalized Warp-loving psyker this is a good place to start. Languages Low Gothic, High Gothic; telekinesis 150 ft.
Power of the Warp. As a bonus action the Rogue Psyker can expend power to create one of the following effects. When they do so, roll 1d20. On a 20, roll once on the Wild Magic Surge table. 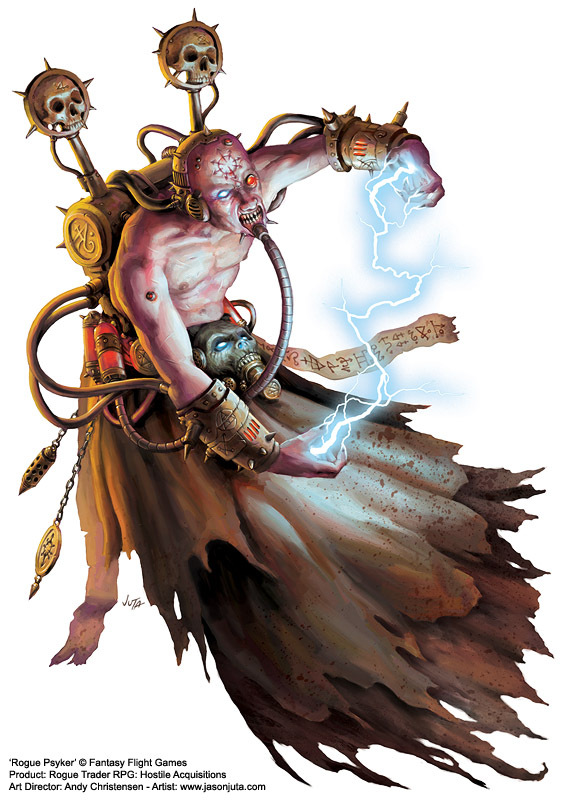 On a result of 1, the Rogue Psyker makes a Wisdom saving throw (DC 5 + 1 per previous save since last long rest) and on a failure they become possessed by a daemon (of the GM’s choice; as the dominate monster and true polymorph spells). Bewitch. The Rogue Psyker chooses a creature they can see within 60 feet. The creature makes a DC 18 Intelligence saving throw or gains the poisoned condition. By spending an action to activate this feature the Rogue Psyker stuns the creature instead. Elemental Blast. Choose one of the following elements (once chosen, this element cannot be changed): cold, fire, lightning, or thunder. The Rogue Psyker makes a spell attack against a creature or object they can see within 60 feet. On a hit, the target takes 32 (6d8+5) damage of the chosen element. Psy-Blast. The Rogue Psyker makes a spell attack against a creature or object they can see within 120 feet. On a hit, the target takes 27 (4d10+5) psychic damage. Psy-Deflect. Until the start of the Rogue Psyker’s turn, the Rogue Psyker’s AC increases by +5 and they have advantage on Dexterity saving throws. While this is active if the Rogue Psyker is subjected to an effect that allows it to make a Dexterity saving throw to take only half damage, the Rogue Psyker instead takes no damage if it succeeds on the saving throw, and only half damage if it fails. Unarmed. Melee Weapon Attack: +6 to hit, reach 5 ft., one target. Hit: 3 (1d4+1) bludgeoning damage. Bolt Pistol. Ranged Weapon Attack: +8 to hit, range 300/600, one target. Hit: 9 (1d12+3) bludgeoning damage. Uncanny Dodge. When an attacker that the Rogue Psyker can see hits them with an attack, the Rogue Psyker can use their reaction to halve the attack’s damage against them.